Involvements from third parties often choke the intended workflow. Take the example of watering your plants – if the city council makes it mandatory to file a no objection certificate before watering each and every plant in your garden, they will be doomed soon enough. Well, the same situation can be seen with US carriers and their unnecessarily complicated update certification policies. While the global variants of the Galaxy S10 lineup got the March security update at the end of March, US S10 users were stuck with February patch. The list of monthly security update models are subject to change as the regular support period expires. Also, some carriers may only support quarterly updates for all applicable current models listed above. The global Exynos powered S10 got ASC8 build as March update, which reportedly solved the deep sleep bug. However, Samsung pulled back this particular build due to undisclosed reasons. It was later replaced with ASCA build. Interestingly, Sprint became the first US carrier to roll out the March update with the ASC8 tag for Galaxy S10e, S10 and S10 Plus. Besides typical stability patches, the carrier also included important network fixes to correct the LTE/ data connection glitches. The rollout was started almost at the end of March. However, the update was not effective to resolve all the connection glitches for Sprint Galaxy S10 users. The carrier even suggested to opt for RMA. Some publications reported that Verizon was rolling the March update in the form of ASC8 build. However, that was a blatantly incorrect information. Even the build tags and model numbers were different from the Verizon branded version – ‘BGL’ is the country code (CSC) of Bulgaria whereas the ‘F’ models (G973F) are powered by Exynos SoC. Amidst the confusions, community members spotted a new build (ASD3) on T-Mobile branded Galaxy S10+. We analyzed the new update and described its April compilation date. The incremental update packages were eventually captured and mirrored by community members. Because of the nature of the OTA packages, they are compatible with every US carrier branded model and can be manually sideloaded. Works for all carriers. No data loss here 24 hours later. Perfect! Verizon and no issues. A T-Mobile representative later confirmed the existence of the build. On April 8, Verizon officially added the ASD3 build in the update tracker pages of the Galaxy S10e, S10 and S10+. Users also reported about getting the OTA update. Among the major four carriers, AT&T was mocked heavily due to their laziness. Comment from discussion my_name_is_josh_83’s comment from discussion "Verizon update is now out.". 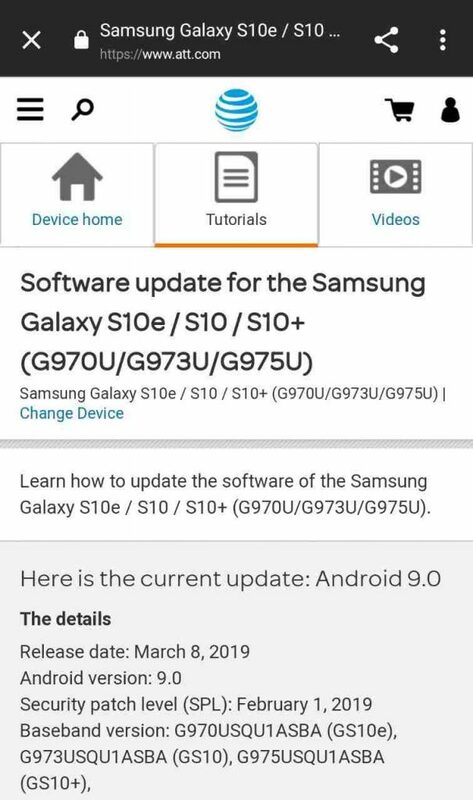 Nevertheless, the update is reportedly live for AT&T Galaxy S10 users. As you can see, AT&T replaced the generic Samsung updater with their own ‘uglier’ version. The OTA prompt is fairly minimal and doesn’t even mention the security patch level or the build number. Anyway, users have already shared those info. Comment from discussion shmeegs822’s comment from discussion "I have 400 plus apps, is this normal?". The fingerprint reader is notably faster after the update (we already mentioned it in our previous article). Comment from discussion Capsfan1984’s comment from discussion "FYI: AT&T software update (536MB)". Comment from discussion mic_crispy’s comment from discussion "FYI: AT&T software update (536MB)". 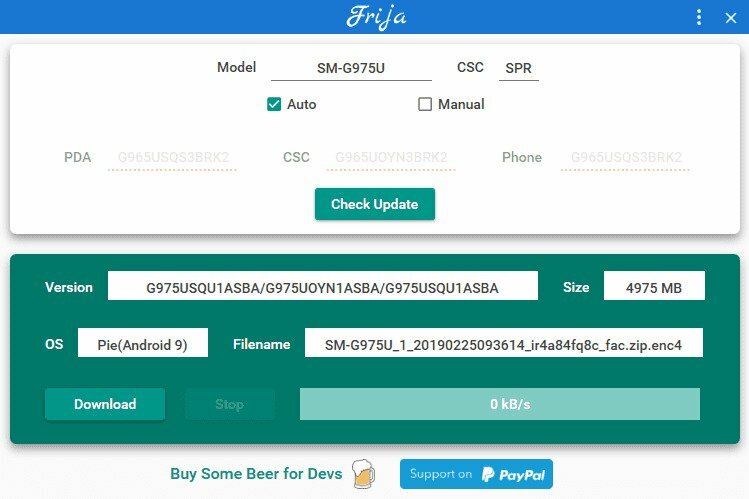 AT&T strictly prohibits Samsung to upload these firmware variants to their OTA update servers, thus it is not possible to download them using Frija or similar utilities. FYI, AT&T is still listing the ASBA build as latest one in their Galaxy S10 update tracker. It’s worth mentioning that the US unlocked Galaxy S10 models are still stuck with the day-one (ASBA) build for a month or so. PiunikaWeb is closely monitoring the rollouts, so stay tuned for new articles on the updates from us.